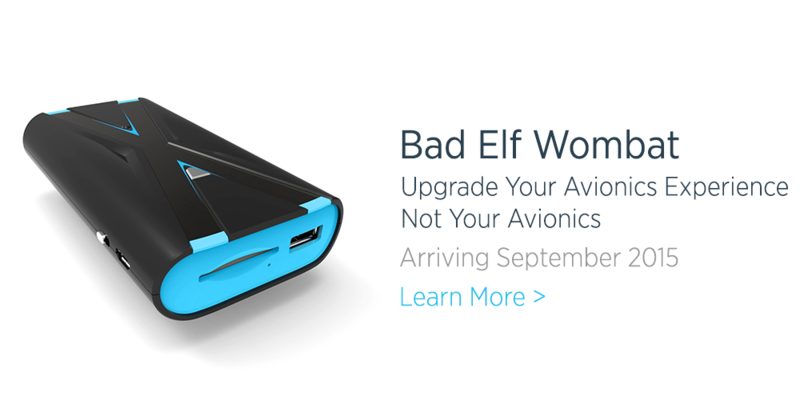 We’re excited to announce Bad Elf Wombat, a new portable accessory that simplifies how you download and install NavData updates into your avionics every 28 days. It removes the annoying step of taking memory cards home or finding a computer at the FBO, allowing you to complete the entire update process using your iPad or iPhone, without leaving the cockpit. Download and install NavData updates from anywhere in the world without leaving the cockpit, using only your iPad or iPhone! Collect flight and engine logs from your avionics after every flight, and upload them automatically to CloudAhoy or CirrusReports. Use your favorite EFB app to create your flight plan at home, and load it into your avionics during pre-flight with minimal button presses. The Bad Elf Wombat accessory is battery powered, so you just turn it on and plug in your avionics memory card. Your iPad or iPhone connects via Wi-Fi to the Wombat device. Apps such as CloudAhoy, EFB apps, or our free Wombat utility app can then write and read avionics files to and from the memory card. Once the data is transferred, you simply remove the memory card from the Wombat, and reinsert it into your panel. The card stays in the aircraft the entire time. We wanted Wombat to earn a place in your flight bag, so it also functions as a back-up USB battery pack. It has 2 USB ports and can fast charge both your iPad (2.4A) and iPhone (1A) simultaneously. The rechargable 9800mAh battery pack can recharge your iPad from 0 to 100% in just a few hours. Over the next few weeks, we’ll be announcing more information about Bad Elf Wombat, including our partnerships with app vendors, supported avionics, some yet-to-be-announced features, pricing, and production status. If you’re interested, please follow the link below and sign up for the notification list so we can keep you updated on our progress!